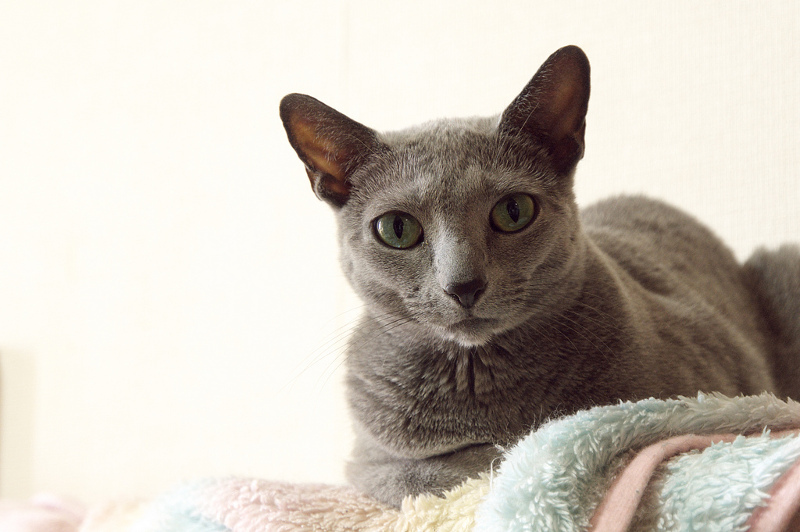 The Russian Blue Cat is renowned for being one of the best breeds of cats to have as a pet. This is most likely due to their beautiful unique coat and exuberant personalities. It’s common for people to not know much about Russian Blue cats. Some picture an exotically blue coloured cat that would be featured on some crazy Vegas show. This breed however only has a bit of a blue tint to its coat. As a matter of fact, chances are that if you saw what it looked like, you probably know someone that owns one, they are fairly common house pets. These cats have an average life expectancy of about 10-15 years and usually live quite healthy lives since they aren’t prone to any specific illnesses. They are a naturally occurred breed and hence they have little to no genetic abnormalities, which makes this breed even healthier. Some cats make it to live up to 25 years! The colour of their coat is actually a blueish gray tone. It grows short and thick in two layers, also known as a “double coat”. The undercoat is very soft to the touch and the hairs have a silver tip that gives the fur its shiny appearance. The tail of the Blue Russian will typically have very light and faint stripes that are usually hard to distinguish unless you are close to the cat. In contrast to the sleek blue-grey coat, these cats have beautiful green eyes. It’s no surprise that these cats are so popular since they have such a refined and majestic appearance. The Russian blue is a medium sized cat, with an average weight in between 8 and 15 pounds. The male Russian Blues are generally larger than females but besides that, they usually look similar. As kittens, their eyes are yellow, but on the fourth month, a bright green ring appears around the pupil. As the cat matures even more, the eye colour changes into a vivid green. This vivid green eye colour is one of the traits which distinct russian blues from other blue shorthaired breeds. However, there is a small possibility your cat not to have green eyes, or to have some characteristics the Siamese cats have (see below why), but nowadays this is very rare. Apart from the eyes, the Russian blues have a lean body with a tight set of muscles which rest on a fine-boned body giving this breed a very elegant and royal look. 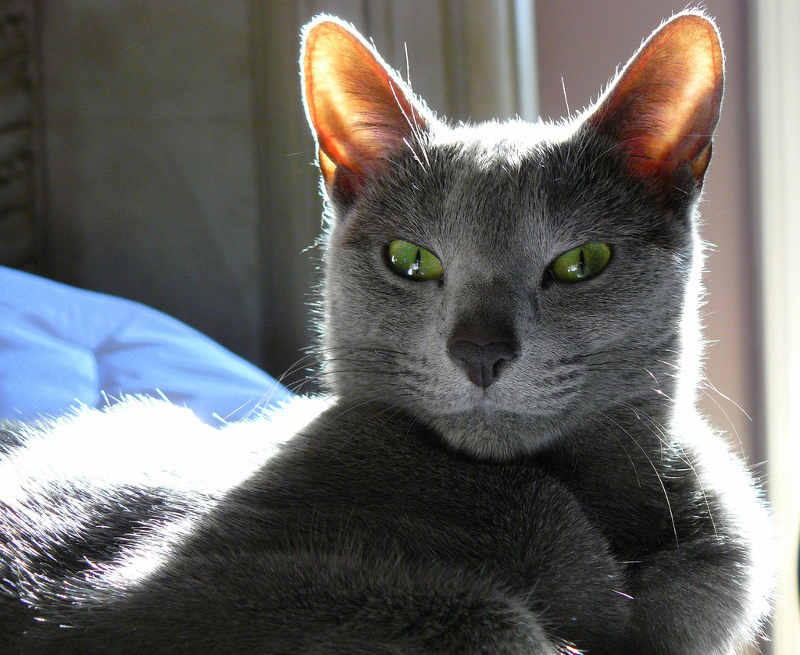 Last but not least is the famous Russian blue smile or as some people call it the “Mona Lisa” smile. Their mouths are somewhat upturned giving them an enigmatic smile that looks like the famous Mona Lisa’s smile. Like the one in the picture below. The Russian Blue is a breed that originated from, you guessed it, Russia. It isn’t confirmed exactly where and when the breed was first discovered but they did make their first appearance ever outside of Russia when one was brought to England in 1875. They didn’t become very common in America until after World War II, when breeders created the modern version of the cat that is most common in U.S. households today. Their exact place of origin is believed to be the port of Arkhangelsk in Russia and this is why they are sometimes called Archangel blues. Sailors took Russian Blues from Arkhangelsk to England and Europe in the 1860s. Then in 1875 the first appearance of a Russian blue outside Russia was recorded at the Crystal Palace in England. Until the end of World War II it was common for Russian blues to be bread with Siamese, since there were too few in existence. Later on the breeders used Scandinavian and English Russian Blues to slowly eliminate the Siamese characteristics and bring the breed back to it’s original shape and colour. As side-note keep in mind that some people believe that these cats have been indeed royal cats in the possession of Czars for many years before they were brought to western countries. This rumour exist to this day but more interesting is that it made this breed even more desirable in some royal and wealthy families back then in the late 19 century. Inevitably the breed was associated with royalty. People don’t just love these cats because of their appearance and royal background however. They have also been widely known to score high in intelligence and have vibrant personalities. The Russian Blue usually forms a strong bond with their owner and commonly shows displays of affection with those it is familiar with. They aren’t an overly hyperactive breed but they have been known to be very playful. They get along well with other cats and are usually pretty good with children and strangers in the house. Since they are so smart, they usually pick up things easily and have even been known to play fetch with their owners. They do have some difficulties as well, russian blues won’t even think about getting in their litter box if it is dirty, so this is something you should keep in mind. They also tend to startle very easily and it is not uncommon to hide if you have guests in the house. If they do appear they will be very shy. Since they are very playful and affectionate sometimes might demand more attention than what you are able(or have time) to give. If you ignore, or neglect them in such cases they might be hurt emotionally, so try to schedule some time with them. These cats are also know for their ability to sympathize human emotions and trying to cheer you up if you are in a blue mood. Affectionate, empathetic but restrained and independent at the same time, it is no surprise that so many stories are being told about these cats and that so many royal families wanted to have one as a pet. This cat also is great for people with pet allergies since their thick coat keep the allergens held in closer to the cats skin. Some researchers also believe that they produce less glycoprotein, which is the main reason why people have pet allergies. 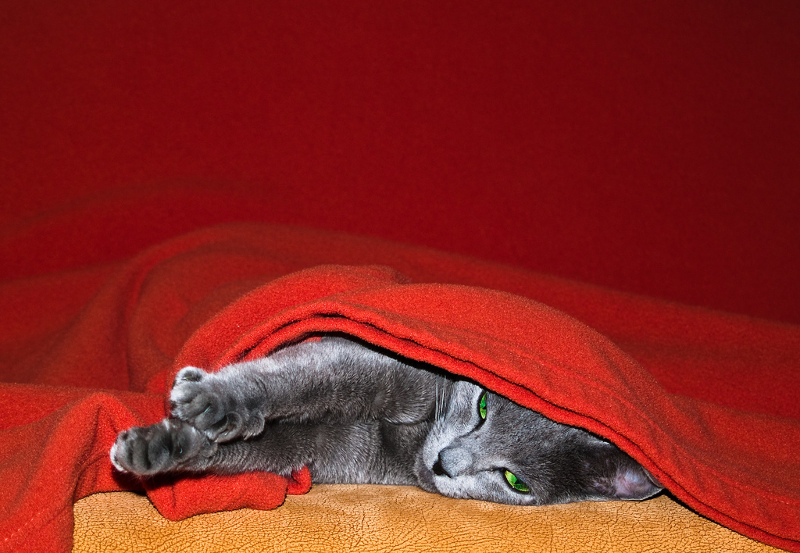 This does not mean that if you have allergies to cats that you should buy a Russian blue and that you will be ok. What it means is that, someone with minor allergies to pets, will have less significant symptoms when with this cat compared with others. A Blue Russian’s diet isn’t very specific or demanding. They are known for their love for food, without being to picky about it. They will be satisfied with basically any type of cat food and don’t have any uncommon nutritional needs. Good and regulated nutrition is advised though if you want your Russian Blue to have a life expectancy of over 15 years. Russian blues will always ask for second plate, even when they don’t need it and for this it is common to end up overweight. If you want your cat to be fit, be careful with food and the treats as well! Let’s go to the training part. Since they are smart, they learn tricks quickly, but it is important when training this breed to maintain a level of discipline. Some people say that you will get trained by the cat and not the other way around. To some extent I believe this to be true. So if you don’t want to be trained by your Blue Russian maintain a level of self discipline from the beginning of your relationship and you will be fine. Training can be done at later age but it is not recommended. It is better for all of you, that you start the training early when he or she is still a kitten. Training is easy, reward what you like and punish them they behave inappropriate. Remember that punishment and reward must be done immediately after the action, not 10 minutes later. Overall, Rusian Blues are a great house pet due to their intelligence and typically friendly behavioural traits. They are a good choice for those who have never been cat owners before but want to buy a cat and for those who have other pets or children. You can always adopt one for free or you can buy a kitten. They aren’t that expensive nowadays. After all, any price would be small to pay for this royal cat.